In 2011, I put Ree Drummond’s The Pioneer Woman Cooks, Recipes From an Accidental Country Girl in my Amazon.com shopping cart where it sat for months. There were just too many cookbooks in stacks all around the house to justify buying another one. And then I got an email announcing the new Food Network’s series: “The Pioneer Woman.” This new series was shot on location at The Pioneer Woman’s Oklahama ranch. Needless to say, I broke down and bought it. I was smitten. I love Ree Drummond’s style, her eye for natural beauty, her love for her family, and her sassy sense of humor. Did I say she lives on a working ranch?! With horses? And cattle? And I absolutely love she gushes about and describes her husband as Marlboro Man. Her cookbooks are totally right up my alley for fun reading and weeknight (and party) cooking. No nonsense, simple, wholesome, and just plain tasty. 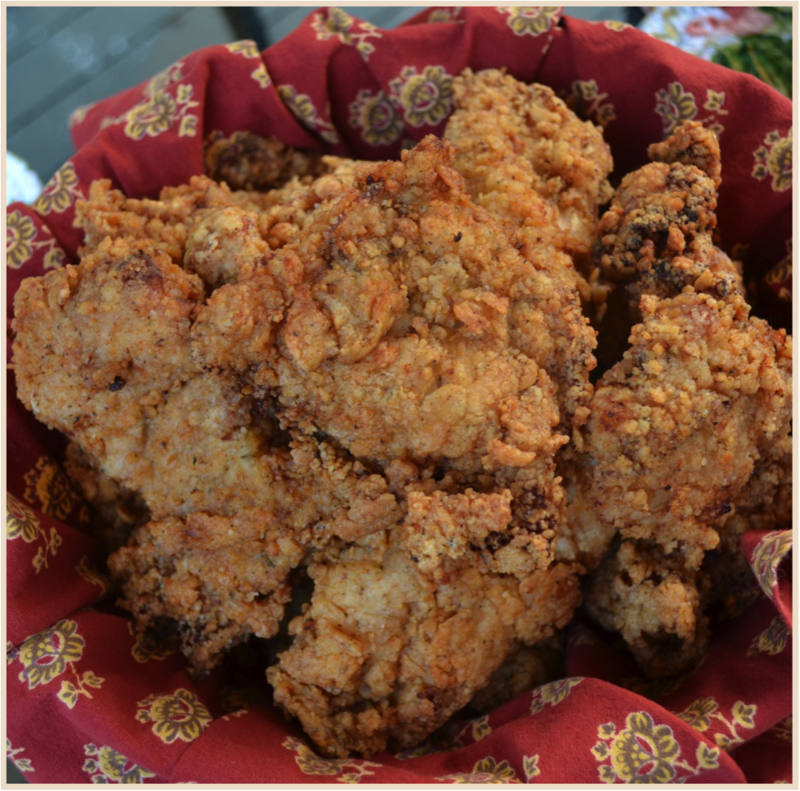 And, since it is still picnic time, I went right to the fried chicken recipe. I was inspired by her recipe, but of course I tweaked it a bit for my taste. I recommend serving with warm honey-buttered biscuits! (see honey butter recipe below). Advice: Plan a couple days ahead to get the best fried chicken you’ve ever had. Day One: Brine the chicken overnight. Day Two: Drain and soak in buttermilk overnight. 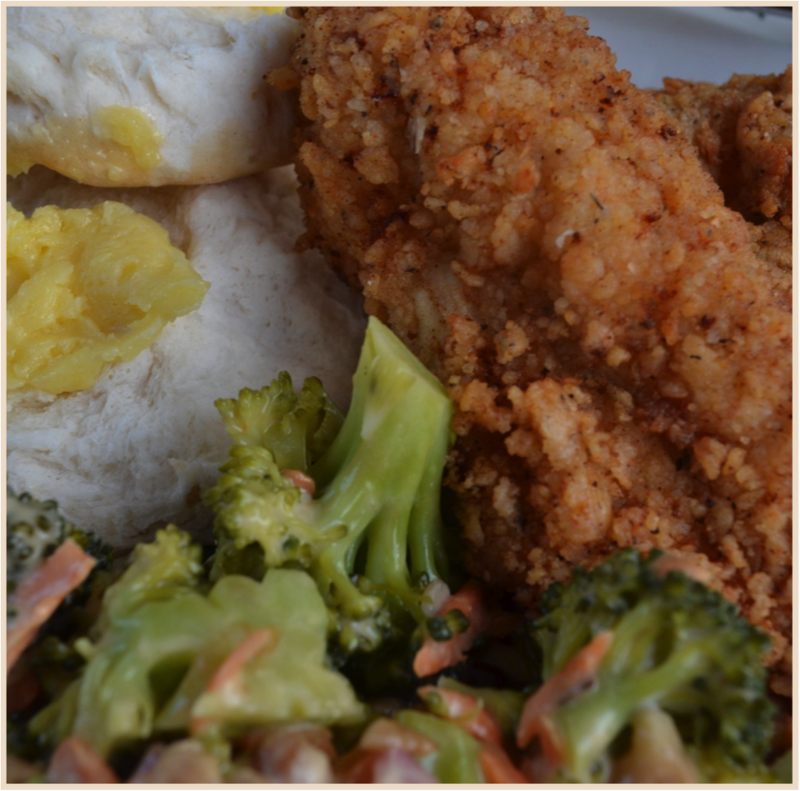 Day Three: Fry it up the next day and serve with a salad, buttermilk biscuits, and honey butter. Day One: In a deep bowl, combine brine ingredients and stir until salt is dissolved. Drop in chicken pieces and refrigerate overnight. Day Two: Drain and rinse chicken from the brine. In a deep bowl, cover the chicken pieces with buttermilk, about 2-3 cups. You may only use half of the quart container, depending on the size of your chicken pieces. Day Three: Drain the chicken, but leave it wet while you prepare the batter. On day three, after the chicken has been drained and dried – in a large bowl, combine the flour, salt, pepper, thyme, garlic powder, all-purpose seasoning, and cayenne. Stir to combine. Add ½ cup of buttermilk to the flour mixture, and using a fork mix it until it’s lumpy. The lumps are what make the chicken really crispy. You can add more buttermilk if you think it needs it. It should not be gooey, but lumpy. Heat about 1½ – 2” of canola oil in a cast iron skillet to 365°. Use a candy thermometer to maintain this temperature. (Monitor the temperature of the oil throughout the cooking process, and do not leave the oil unattended.) While the oil is heating, dredge the chicken pieces in the batter, pressing the lumps into the chicken if you have to. Working in batches of 4 pieces at a time, add the coated chicken to the hot oil (The temperature will drop from the cold chicken, but it will rise back). Cover the pan and fry for 3-4 minutes each side. Place the chicken on a wire rack on a baking sheet, and when all the chicken is done frying you can either keep it warm in the oven until serving or you can let it cool a bit before placing it in the refrigerator. Homemade Honey Butter: Makes little more than half a cup. To make honey butter, simply let 1 stick of unsalted butter come to room temperature and vigorously cream with 3 tablespoons of raw honey. Spoon the honey butter into a decorative dish and store in the refrigerator until needed.